It's fall. It's the end of October. There's finally a chill in the air here in Michigan. The leaves are changing and falling. My boots and flannels are calling my name, and I'm ready to embrace all that autumn has to offer. 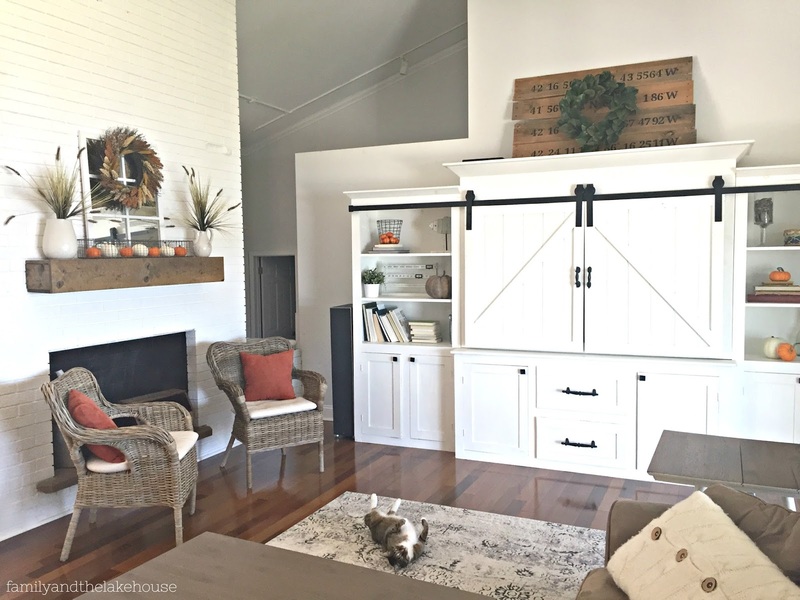 We made the most out of our summer and as difficult as it was to pack up our summer toys, it's exciting and comforting to cozy up inside with comfort foods, twinkle lights, blankets and family...oh, and my furnace...I love the warmth and sound of my furnace! Ha! 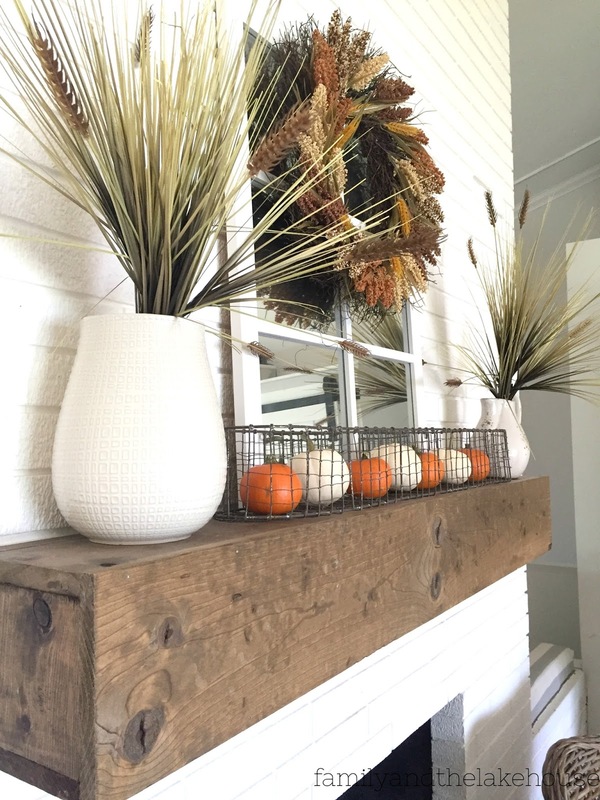 To welcome the arrival of fall, I decorated a bit here and there and today I thought it'd be fun to share with all of you some fall touches throughout our home. Our entryway consists of only a few pumpkins, these affordable pillow covers from Amazon, free artwork from Lauren over at Bless'er House and some super cheap and easy frames. 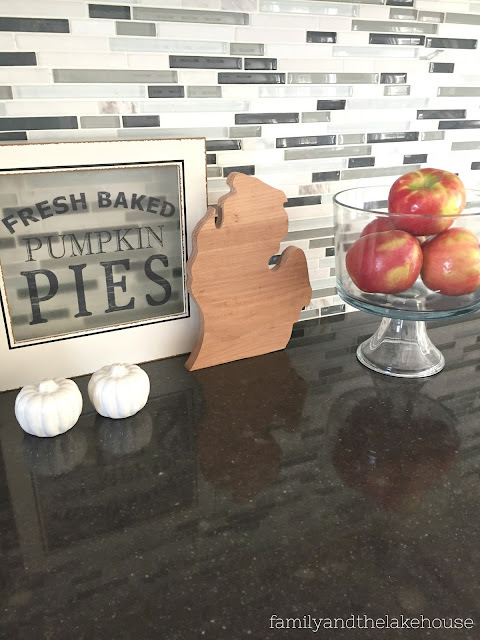 In the kitchen you'll find this cute little chalkboard, a pumpkin jar that my mother-in-law bought for me a few years back, some delicious smelling Mrs. Meyer's hand soap and a simple buffalo check hand towel. Honeycrisp apples, that is! There's nothing better than decorating with food, am I right!? The only problem being that the "decor" doesn't stay for long! I'm all - Get in my belly!! Ha! Let's head into the living room. I had a command strip/sticker thingy already in place from a previous wreath and I had thought about moving the strip thingy to center it up in the middle of the mirror. Then I was like, "Nah - it's fine." Then I was all, "I really should buy two new matching vases for those spikey-plant-things (all technical terms, I'm sure)." Then I asked myself why...why spend the extra money...who cares...it's fine. Anyhoo, that wreath you see there is from Big Lots, the spiker-plant-thingys are from Hobby Lobby and the pillows are from Walmart! Okay and now, let me be completely honest with all of you. As much as I've loooooved decorating this piece for fall, I'm honestly waaaaaay more excited to decorate this lovely lady for Christmas! 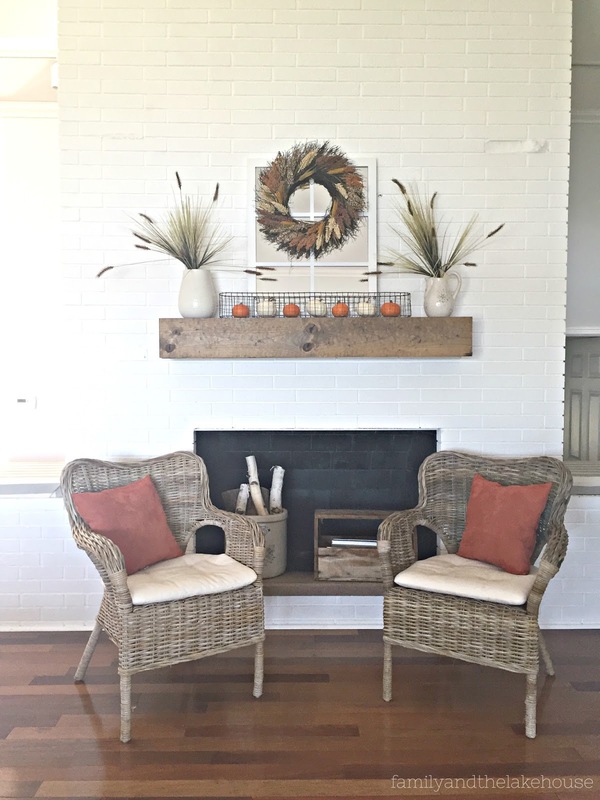 Our cozy (to me) fall home tour, a cat who doesn't care and is acting like a honey badger and a girl (that'd be me) who just blogged twice in one week. Wahoo! 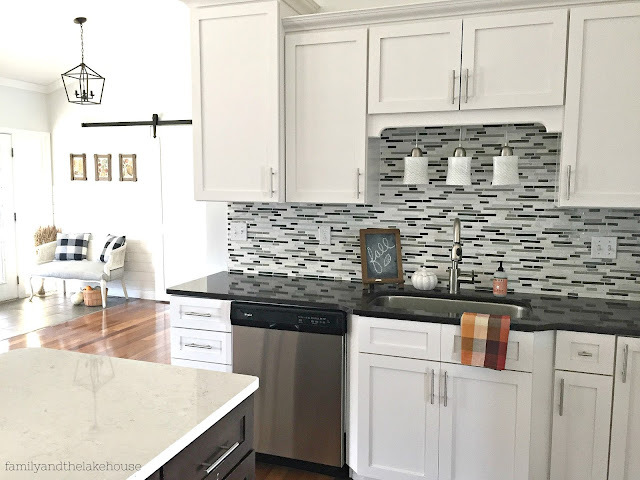 Thanks for stopping by and for scrolling through my little home tour! 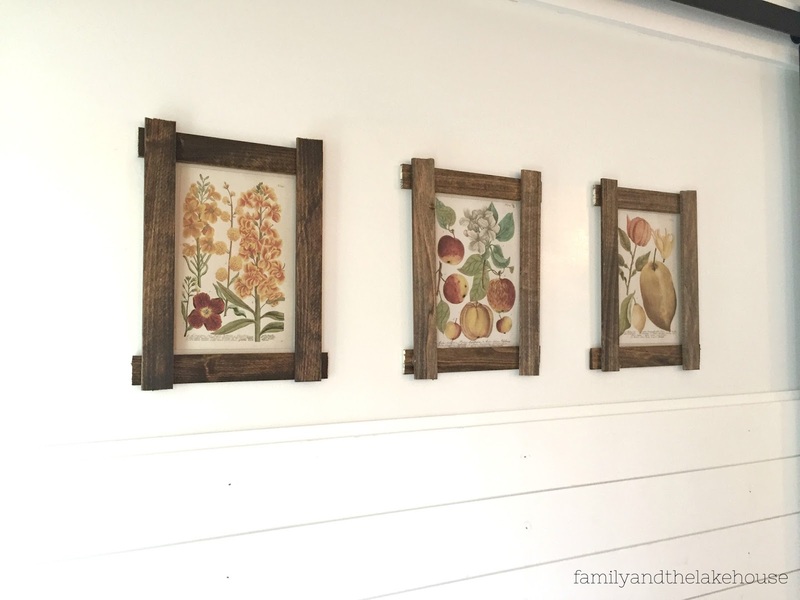 I'm linking up with Totally Terrific Tuesday. Hey there and happy Tuesday to ya'! 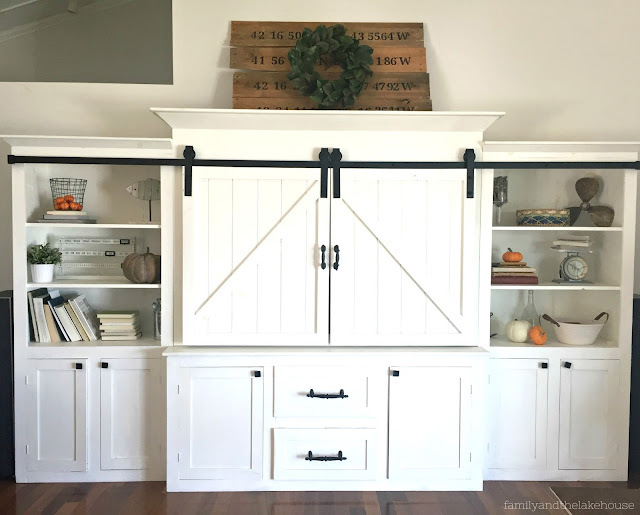 I thought I'd stop by today to share with you guys a little more of my barn door entertainment unit and to take a closer look at what's inside those cabinet doors and drawers. 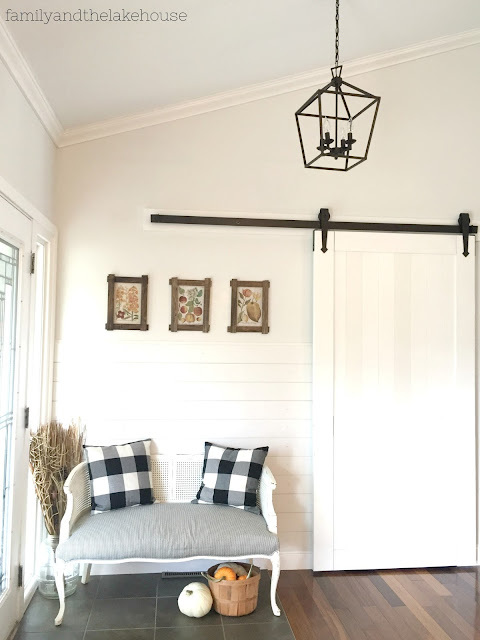 In fact, I hadn't even thought about sharing how we utilize this piece until I was introduced to the amazing online interior design company, Havenly. 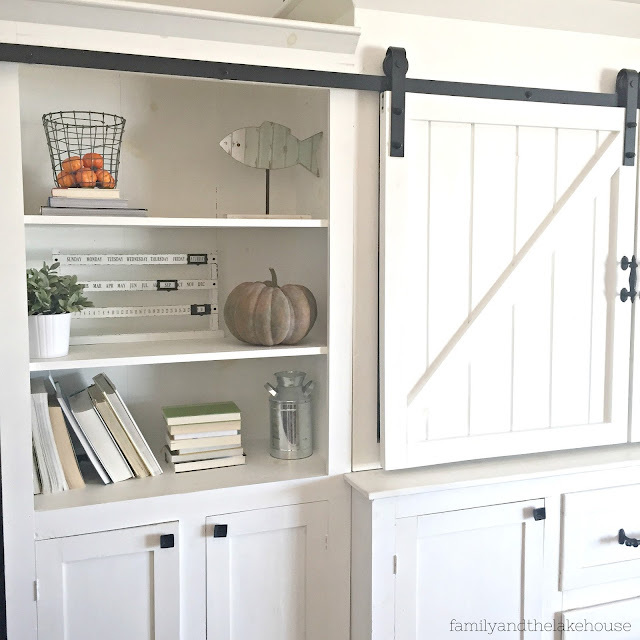 They got me thinking about my favorite and most beloved piece of furniture in our home along with the idea to share how we use it on a daily basis. I visited their website and loved what I saw and wanted to share it with all of you! You guys, Havenly is choke-full of ideas and is completely user-friendly. 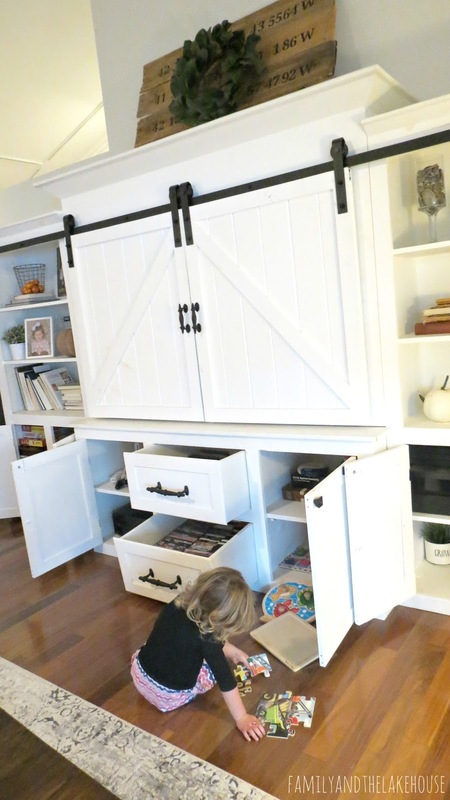 What a great idea to share how we use this puppy in our home on a daily basis! Believe me, this thing gets used all.the.time. You can read more about the story behind this unit here. 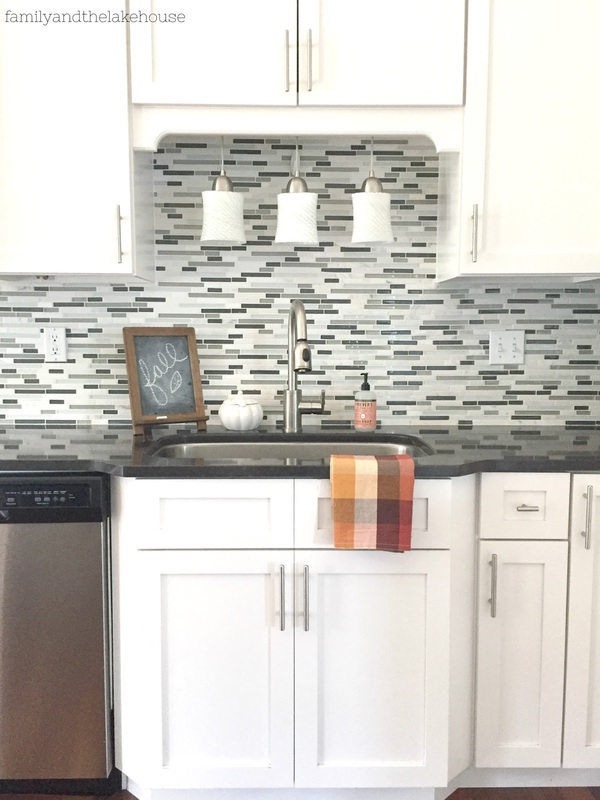 The picture of the unit above was meant for my fall home tour here on the blog. If you look closely below, you'll see how I've changed things up and incorporated our family photos and the kids' school photos when the unit is not being photographed for blog purposes. I love how easy it is to showcase my favorite people on the shelves and I also love that I don't need to put holes in the walls to display their cute little faces! Easy Peasy. Let's take a closer look at what's behind all those closed doors, shall we? 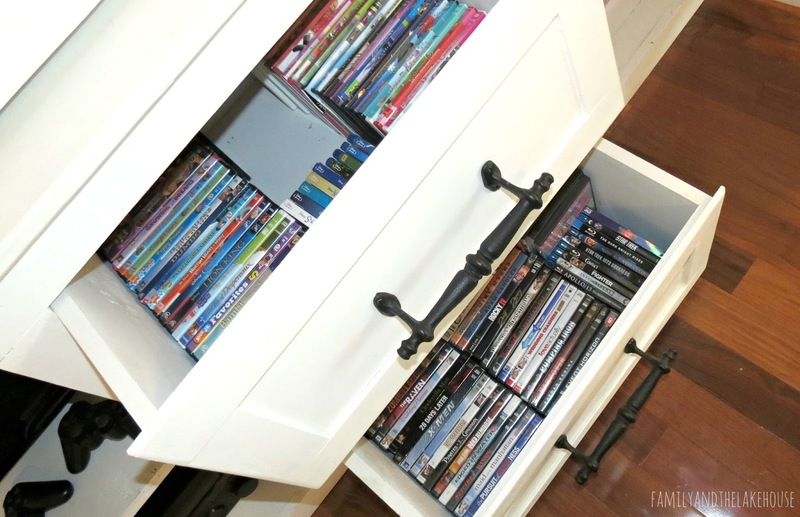 This unit was 100% designed to hold games, gaming stations and DVDs/Blu-rays. Before this piece was built our games didn't have a "home." It bothered me like craaaazy. Boxes would get stepped on and game pieces would get lost. I found myself becoming frustrated over the lack of a dedicated spot in our home for our games. 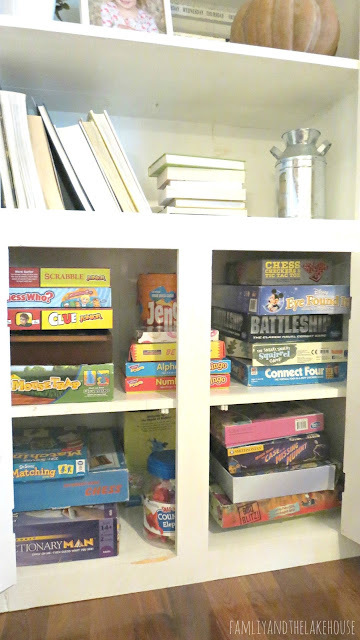 As the kids grew, so did our collection of puzzles and games. It became overwhelming. Most games ended up in our crawlspace due to our storage issue. Let me tell you, I loathed going into our crawlspace to find Disney Monopoly! 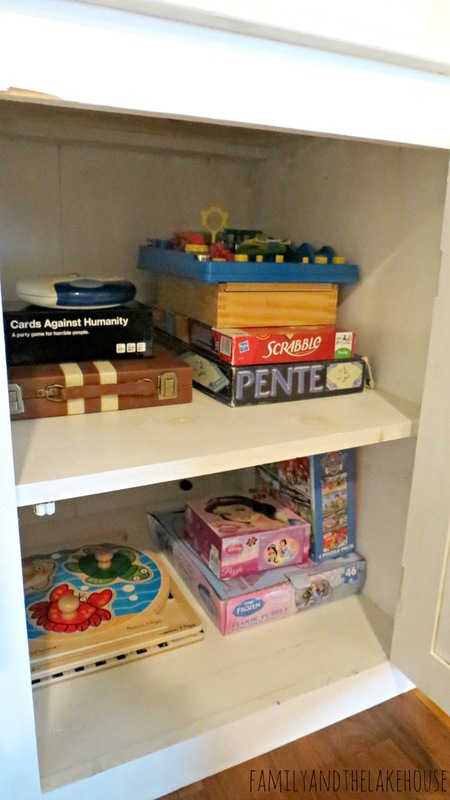 Nowadays, the kids keep all their games in one central location! We don't use a traditional DVD player anymore, actually we haven't for many years now. 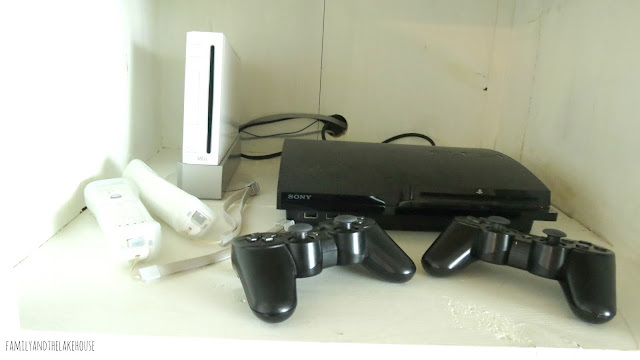 We use our PlayStation for all our videos and I just love how these devices and their cords stay hidden! When designing this unit I knew that I'd want drawers to store all of our DVDs and Blu-rays. I also wanted to store them exactly as you see them below (title side facing up) so that we could easily look through and find the title of the show we were looking for. Next up are some of mine and Jon's games and some puzzles for the kiddos. I'm not going to lie, I just sorted these out yesterday. There was a bit of space to use in this cabinet so I took advantage of it the best I could. It also just so happens that our family albums fit inside perfectly. 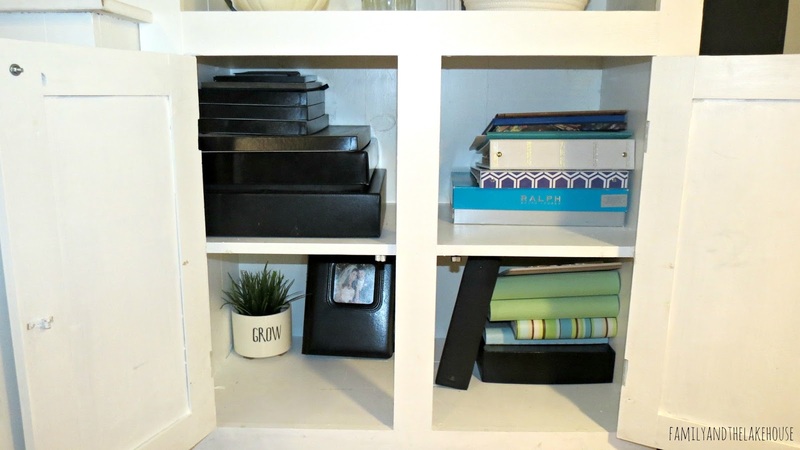 Seriously, I love, love, love all the storage this unit has to offer! The kids' albums, the baby books, our wedding album, some yearbooks and some memory boxes sit inside this space. This cabinet is THE most special...obviously! I keep telling myself that I need to scan the kids' baby books into the computer since the memories inside those pages are the most precious and dear things to my heart. This piece of furniture holds a lot of fun and a lot of memories on its shelves, within its drawers and behind its doors! 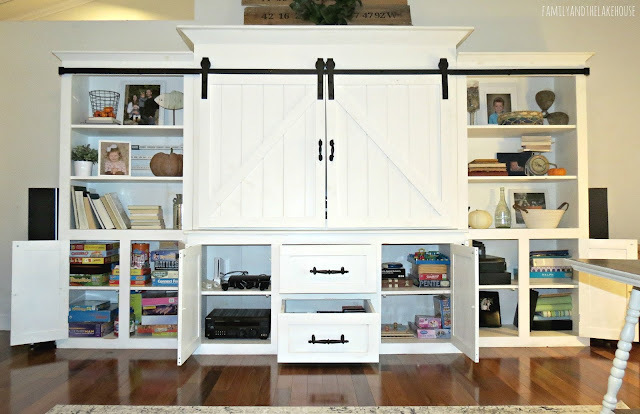 I love that I once had a dream about this entertainment unit in my head, it landed on paper and it became a reality! My little design assistant seems to be hard at work...and you know what? I'm linking up with Tuesday Talk and Totally Terrific Tuesday. How about a photo dump and life lately blog post for ya' today! A couple weekends ago Jon and I took the kids to our high school alma mater to watch our niece play in the marching band. It was also their homecoming, so the visit made it that much more special. It was crazy to bump into a few of my classmates and hear the last names of some of the homecoming court - I was all, "I know that kids' parents!" I can't believe how much time has passed and how some of the people Jon and I went to high school with now have seniors in high school! We spent the night at Jon's parents' house the night of homecoming and stayed the next day a little into the afternoon. The kids love it at Grandma Terri and Grandpa George's house! Later in the day we headed to our nephew's fourth birthday party at an indoor bounce house place. Jon and I were sporting our Michigan gear. He had originally bought us both tickets to the Michigan/Michigan State game, but I decided not to go and he took his dad instead. This place is every kids' dream! The kids bounced their little hearts away and then headed over to the arcade and played lots of fun games. Jon's dad picked him up and they left for the game just as we were finishing up playing in the arcade and redeeming our tickets. We collected our prizes and then I headed to the mother ship - the Pottery Barn Outlet. Oh the things I saw!!! Man-oh-man, that place is dangerous for the pocketbook!! I did my best of walking away from preeeeeeetty much everything. I did, however, come home with two pillows...that I didn't need. I just couldn't resist. Wait. Why are they yawning?! I was all, "My sweet little children, Mommy loves this...and this.........and ooooh look at this....oh, I like this...............look at that.................$500!?!? Oooohhhh...but feel this....and that...."
Still. They had zero interest. I was all, you guys - that bench is awesome! I love it!! They didn't care. We were in Pottery Barn for a total of fifteen minutes. I saw this in my hometown and just had to share it! When I first spotted it, I had asked Jon to turn the car around. He didn't. We just headed to our original destination, but on our way out of town, I was driving and I wasn't leaving without getting a picture. It's so "pun-ney!" Haha! Get it!? I ended up buying the CD of Henry's school pictures and I found that the CD included stationary with his picture on it. Although, the paper you see below has his actual printed off photograph lying over the picture on the stationary. This kid has loved printing off his school picture stationary and writing out notes and stories! I took Eliza into a Claire's for the first time ever. I didn't think we'd make it out. Please pray for me during her tween years. We headed over to Gap and Eliza pointed out that I should get one of these tops. Coincidentally I've been joking about getting one ever since I saw that they are back in fashion...are they? Are they really? I need your thoughts on this one. Anyhoo, I tooootally used to rock these mean ladies and I have a story about wearing one back in sixth grade and forgetting to put on a bra... I guess that's pretty much the story. Haha! Spoiler Alert: I ended up sparing myself the middle school embarrassment and luckily remembered to run back to my bedroom and grab a brassiere. Eliza had her school pictures and she rocked some Matilda Jane and piggy tails. I wasn't sure if I'd have her wear her jean jacket, but at the last minute I told her to keep it on and I'm soooo happy I did. Her proofs already came back and they're so stinking' adorable! Jean jacket for the win! The same day as Eliza's school pictures Henry had his first grade field trip to the fire station. I headed over to the fire station at 10:10 to help volunteer starting at 10:15 and to take 20,000 pictures of Henry on his field trip, but his class didn't arrive until a little after 10:30. I stayed for as long as I could before having to leave to pick up Eliza down the road from preschool at 11:00. I was pretty bummed that I didn't get to stay the entire time, but I'm happy I got to stay for as long as I did. Girlfriend was apparently ready to try out a hand spin........in a church (I just googled that. It's an official break dancing term - #themoreyouknow). Henry drew a picture of me. It's spot on. I'm assuming my hands and feet are tucked somewhere into my sleeves and pants due to the change in the weather...ooooor I'm wearing a Snuggie. Jon and I took the boat out for the season. Sad face. It was one of the best summers ever! Henry received an invite to attend a first grade Halloween party with some of his friends from his class. Eliza DID NOT think it was fair that I was letting Henry wear his Halloween costume so far in advance before Halloween and that I hadn't yet let her wear hers. Ladies and Gents, I give you, Tinker Bell! Surprise, surprise - Henry is Pikachu this year. Does anyone actually understand Pokemon? I should be a cool mom and look into it more and try to understand it better, but the fact of the matter is, I just don't want to...is that bad? He looks adorable and that's all that matters, right?! Halloween party in full effect. All the kids got along so well and all the Moms were super nice! At one point, the kids went looking for frogs. Ahhh! Love this little guy. The parents packed up the kiddos and headed over to the not-so-scary Halloween Trail held here in our town. I told Jon that this tombstone has me written all over it. Henry and his buddy, Redmond, led the group into the haunted forest. I'm not going to lie, for as not spooky as it was, it was about as spooky as I'll ever want to go. I DON'T like scary movies or anything gruesome - seriously, I can't even watch Jurassic Park, so this path was perfect for me...and Henry...and all the children............ Ahem. At one point after seeing a scary clown and a few other gruesome things, Henry did inform me that he wasn't liking the trail, so I told him it was just like being at the grocery store in the Halloween section and that there was nothing to be afraid of... LOL! It seemed to have worked. Check out this spooky ghost! The rest of the weekend was filled with lots of rain and indoor activities. We soooo wanted to head to a corn maze and pick out some pumpkins, but the rain just wouldn't let up. We did, however, get to leave the house for a birthday party. I barely took any pictures. Ugh. But, I did get this picture of this itty bitty shopping cart! So cute, right?! Perfect for a Shopkins party! It rained and rained and rained so I decided to teach the kids how my sister and I used to play library. Henry and Eliza then ended up with their own version on how to play library and it kept them entertained for quite some time. After playing library, I showed them how to make homemade play dough. I used to make it all the time for Henry when he was little, but he didn't remember. I was just telling Jon that we need to start to repeat some of the things we've done with the kids because we remember, but it doesn't necessarily mean that they do. So, homemade play dough it was! I decided to get some laundry done and this was my view from mine and Jon's bedroom. Somebody was waiting patiently for me to come back and check out some books. LOL! Then I got out some orange juice, lime juice and lemon juice for the kids to write invisible letters (you use an iron to make the message appear). ...and called it a day/weekend/week/two weeks of blog pictures. I'm exhausted just from writing all of this and from apparently having a science experiment contest with my husband. LOL! Oh and by the way, all that mess behind the kids in every picture was later picked up. Actually, on Sunday night I turned on my MapMyRun and in 19 minutes I had walked nearly half a mile............in my house..............picking up the mess from the weekend.